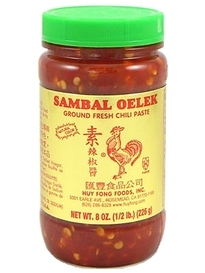 Sambal oelec is a spicy hot raw chili paste, that is bright red, thick and sharp tasting with pepper seeds throughout. Often used as a condiment to add a spicy heat to your dish, it can be used as the base for making other sambals or as an ingredient in many dishes. 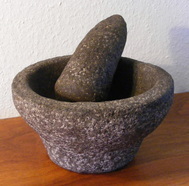 The Ulek is an Indonesian Morter and Pestle. The bowl part is usually made of stone and the pestle out of cured bamboo root or stone . An ulek is used by putting the ingredients in to the bowl part, the Morter, and using a crushing and twisting motion with the pestle. It is often used to crush lime leaves, chilies, peppers, shallots, peanuts, and other kinds of ingredients.